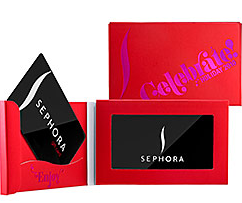 I'm giving my fabulous readers a chance to win this $25 Sephora Gift I got a ways back for by Birthday. And since I got more than one and don't shop at Sephora too often I thought I'd share it with you, with the holidays coming up and all! Leave a Comment telling me what you would get with the Gift Card. All of which must be done by 11/19 at 11pm, Good LUCK! I would use the gift card for Philosophy Amazing Grace! Keep up the great work with your blog. And, congrats on the news! I would use the gift card to put toward a new Urban Decay eye shadow palette. Of course you know I am a follower on facebook and google ! I would get the Too Faced Girls Dig Deals for my niece for Christmas. I definitely get some Philosophy stuff like bubble bath, I love it! Thanks for the giveaway! And like you on FB! I'd buy some lipgloss and eyeshadow! you're awesome! I'd buy the daisy by marc jacobs in the roll on perfume! minqi7@gmail.com i've followed you via blogger! OMG I love Sephora! I would get their Pacifica gift box for Christmas! I follow you and am a Facebook fan. I'd like to get Nars blush. Love your posts.. I'm a fan on Facebook! Thanks for the giveaway opportunity! I would relish in some RnR by giving myself a spa facial with my new Cosmedicine Mega Moisture Mask. I would use it on Bare Escentuals Face Fashion: The Look of Now - Fab Fresh Gift Box. Such a huge fan of your blog! I would get more lipstick from Hourglass Cosmetics. They're the best! My skin is changing so I'd get started with some new skincare! I've always had oily/breakout skin but it's becoming dry (with age!) and I don't know where to start. OMG cool! I would use it to finally find some pressed facial powder that matches my very pale skin!!! I'm a frugalista follower and facebook fan! I'd like to use the gift card to get some new Vincent Longo lipstain. My current one is running low! Omg, I am loving your blog. My friend Kait Lisbeth recommended it and it's awesome. I think I'd use the $25.00 gift card towards Sephora's 'the little black eyeliner kit,' because in the words of Whip It..."You can never have too much black eyeliner. I love that the kit has various sizes and types of black eyeliner because using the wrong type or style of liner can ruin even the most perfect of eyeshadow looks, no matter how meticulously it's applied. In my opinion, eyeliner makes or breaks the style. would love to use it toward perfume for my mom this Christmas! I'd get some Tokidoki products, their bronzer in Royal Pride isTHE best for a pale girl like me! Plus the packaging is super cute! I would probably buy MUFE's concealer palette! I would buy eyeliners! I love the Sephora brand eyeliners, but they're so much more exspensive than the Maybelline or AVON ones I usually buy - I can't afford to be spending so much on makeup! I would love this!!!!!!!!!! I would buy O.P.I nail polish get my hands pretty and ready for the holidays. I would put it towards all the stuff that is in my bag now...clarisonic, urban decay primer potion and D&G perfume! I'd get the Benefit Perfumes, they smell amazing. Or maybe do a little christmas shopping!